I think Pearl had her hands full with her boys. [Snort.] If that ain't trouble, I don't know what is. What do y'all think? 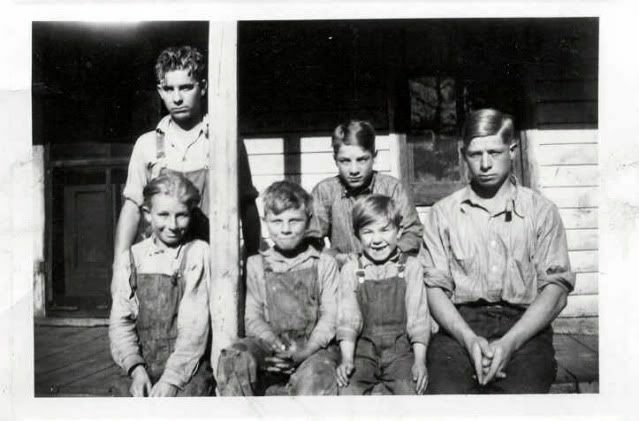 L-R: Glen (standing), Wayne, Donald, Lester (in back), Forrest, and Harold Pointer. T-R-O-U-B-L-E is right. My father-in-law was one of 5 boys (7 kids total) and oh the stories those men tell today about growing up...Yep, T-R-O-U-B-L-E is right!